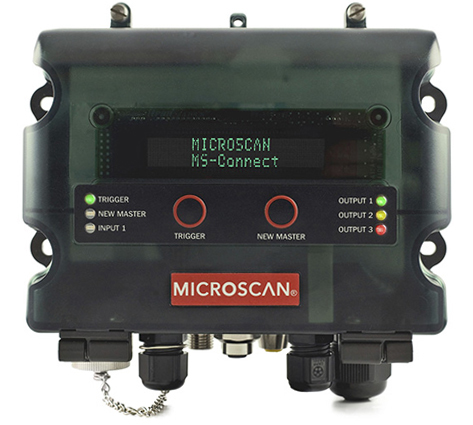 The MS-Connect 210 simplifies connectivity of Omron Microscan readers in industrial applications. 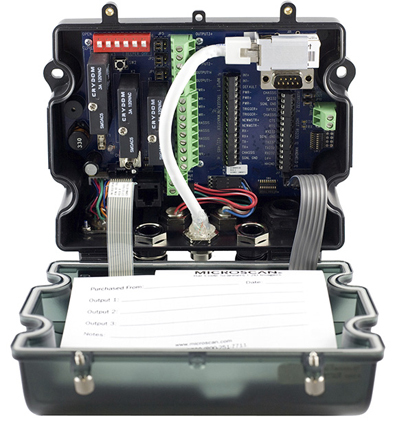 This factory floor ready wiring box features a vivid display, convenient access holes for easy wire routing, and multiple connectivity options including Ethernet protocols. The MS-Connect 210 is the ideal Omron Microscan reader accessory for any users seeking an easy connectivity option. Ethernet Connectivity: Connect to a host using serial or Ethernet connection. Ethernet TCP/IP and EtherNet/IP protocols are available out of the box. Informative Display: Providing two lines of decoded information, the optional display is ultra-bright and easy to read. I/O Indicators: The front panel on the MS-Connect 210 provides visual confirmation of performance. Multiple colors are used for easy recognition. Relay Modules: The MS-Connect 210 includes slots for optional relay modules to allow for greater use of external devices including light stacks. Practical Design: Four access holes located on the box allow users quick, easy, and clean wiring of inputs and outputs. Mounting is simplified with four accessible through-holes for mounting screws. An optional plate is available for easy DIN rail mounting. Clear Wiring Path: Wiring to the appropriate terminal block is easily accomplished, due to the access holes and a clear area located between the terminal rows. 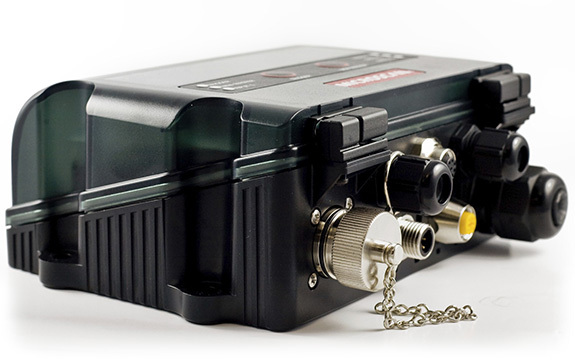 Additional Power: The MS-Connect 210 includes the option to power three additional readers. 61-000128-01 Cable, external Micro-Change to internal Ethernet module, MS-Connect 210, 8 in.